There was thunder, lightning and floods in Ainsa this weekend heralding young Martin Maes' first Open Men's podium. Martin took 3rd place in his second season of racing the GC - even though he still qualifies to ride as a Junior until the end of this season. The race kicked off with a Prologue around the beautiful town of Ainsa. Because the points didn't count towards the race it wasn't too serious an affair, with some of the riders in fancy dress and our own Mark Maurissen setting up his own special version of a feed station - with tequila shots! We're pleased to report that Martin took the prologue 2nd, and refused Mark's offer of a drink! 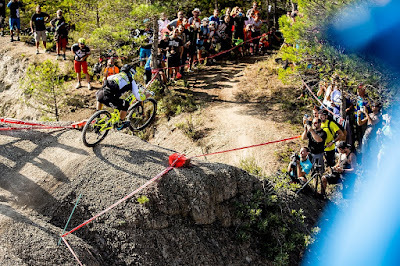 Saturday dawned fine for the serious business of the race and Martin was in good spirits as he headed up to the first liaison, prior to Stage 1, the obstacle-strewn Penas Cinglas. Martin rode smoothly to take sixth on the stage with Richie Rude taking the stage win, just four seconds ahead of Maes. Rude also took Stage 2, a really long stage (3.52km) with a brutal climb right at the end of the stage. Martin was pleased with his stamina on this stage, taking 3rd on the stage moving into 3rd place overall. A long liaison to Stage 3 posed little problems but a huge storm broke as riders made their way to Stage 3. The riders had practiced all week in glorious sunshine with bone dry, dusty and loose tracks. The surface of Stage 3 is full of loose stones and slick with loads of fossils. Martin said that with the rain he found it very difficult to judge the grip he could rely on for this stage. The thunder and lightning knocked out the live timing but once it was re-established it emerged that Richie Rude took this stage again with Martin dropping back to 6th place overall, 21st for the stage. Stage 4 was similarly slick. Martin regained confidence and said that he felt fast on the stage but was disappointed to finish 11th. Richie Rude took his 4th stage win. If Day 1 was dramatic, Day 2 got really exciting! 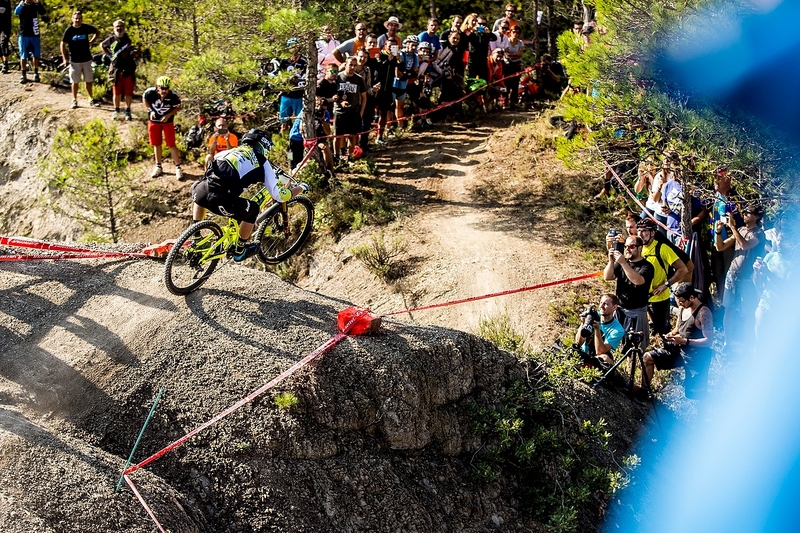 Stage 5 was the shortest stage of the entire EWS and Martin felt entirely at home. He was totally pinned, taking an amazing two seconds out of the field over a one minute 23 second stage! Stage 6 was super physical and technical with some fast pedalling sections. Martin said: "Stage 6 confirmed that I was having a great day! I always felt at the limits of myself and that I was riding exactly as I was capable of. I'm so happy to finally put it all together on a physical and technical stage." Nico Lau took the stage win with Richie Rude in 2nd and Martin was just 0.3 seconds back in 3rd. Stage 7 was "unreal". Martin said: "The last part of this stage was incredible fun. Once again i pinned it as hard as i could and ended up only one second back. I found a lot of flow and took 2.5 seconds on Vouilloz so i was very pleased." Stage 8 was cancelled when a torrential rainstorm turned dry river beds into raging torrents in what organisers called "the most extreme weather the Series had ever faced". 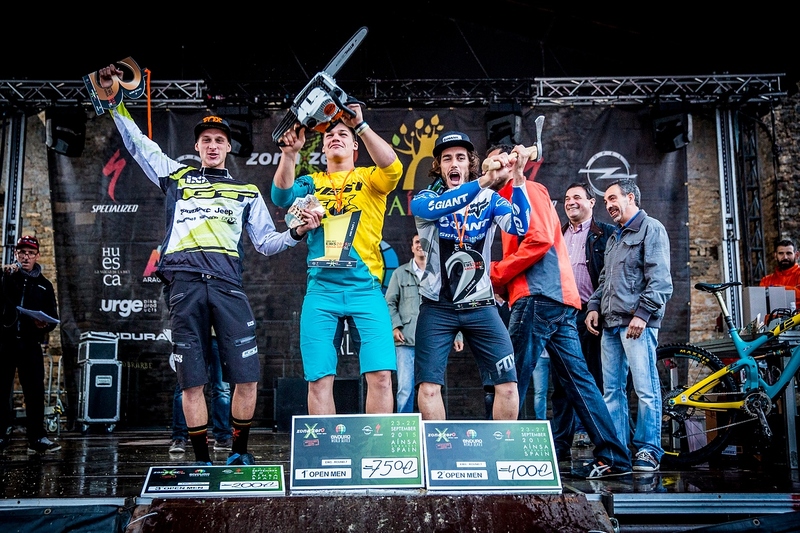 So results included stages 1-7 and Martin was 3rd, just 0.1 of a second behind Yoann Barelli, who took 2nd place. An awesome result for a rider who is just 18 years old. Martin said: "The level of the race was so tight, and i think everyone had so much fun. The riding was awesome and the whole atmosphere with so many spectators was buzzing." Team Director Dan Brown said: "We are all stoked for Martin - we've expected this podium for him for a long time now, he's been riding out of his skin this week. Nice job Maes-dog!"